IF Joe Schmidt insisted the Principality Stadium remain unzipped, the open roof merely offered a stark view of how rapidly and completely Ireland have tumbled from the rugby heavens. From soaring giddily to the November stars to a chastening springtime thud against the sodden Cardiff earth, the high velocity plunge has been disturbingly precipitous. The gravest concern with their World Cup moment of destiny looming is that the decline in performance, the stalled momentum, might be irreversible, terminal. Joe Schmidt, understandably, urged the nation not to give up on his team. Grand Slam winners a year ago, big game hunters in autumn, they have enormous reserves of credit in their bank account. Even if a chunk of it has been frittered away in recent weeks; the currency of their ling term ambition devalued. Six months out from the defining weeks of their lives, this is a team in apparent, unstoppable free-fall. The foundation stones of Ireland's palace of achievement - Johnny Sexton, Sean O'Brien, Rory Best and Conor Murray - look to be jaded, running on empty, broken. O'Brien was hauled off early in the second-half, a disconsolate figure. Best followed soon after. Both looked like fighters who had taken one punch too many, who had little more to give. Sexton had surely his most ruinous 80 minutes in an Irish shirt: His kicking radar completely malfunctioned, he sent simple passes straight to touch, he turned-over ball. It was as startling as observing a grand-master struggling to recollect the basic rules of chess. As Wales raced over the horizon, the World Player of the Year was a portrait of befuddled frustration, like a rush hour commuter late for work but unable to find the car keys. 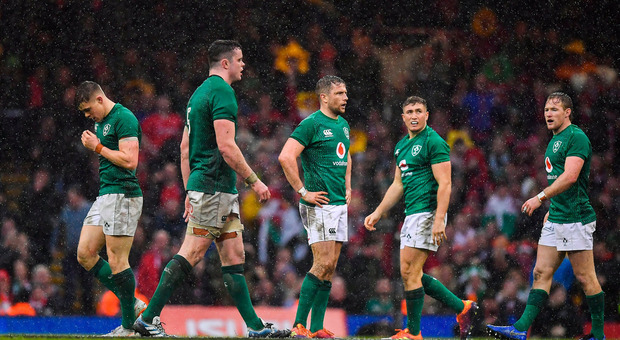 Ireland have played two serious opponents in the Six Nations and have been utterly out-thought and outclassed on each occasion, reduced to roadkill beneath the English chariot and, now, Warren Gatland's crimson juggernaut. The last 50 days have unspooled as crippling anti-climax, a brutal, slow motion car-crash. Ireland are suddenly an unmoored elevator, clacking helplessly downwards through the floor. Lost momentum is notoriously difficult to rediscover. November's slaying over New Zealand suggested that Ireland had already stormed through the barriers separating the very good from the authentically great. The Six Nations has spat them back out into the land of the common man. Schmidt's side were a study in mediocrity, here: Colourless, pedestrian, incompetent. Even under a microscope it was difficult to locate a single redeeming feature. Another statement of defiance from James Ryan was perhaps as good as it got. All the rumbling potency, the brilliant momentum that did for the All Blacks just four months has been lost. In its place is a clueless, low-grade, featherweight chaos. As the glorious Welsh hymns filled this great rugby cathedral, Ireland were despairingly mute, a shadow of the giants who rose to world number two. Ireland's autumnal superhero cape has been replaced by an Inspector Clouseau trench coat. Sorcery has given way to bumbling incompetence. Certainty to doubt. Joe Schmidt's final Six Nations game as Irish coach was maybe the poorest of his 30 in charge. It can be summed up in one pithy synopsis: Catastrophic systems failure. Even a powerful calculator might struggle to accurately tot up Ireland's bulging catalogue of errors. There was self-destructive indiscipline on an industrial scale, eight penalties conceded in the opening half alone. Perhaps referee Angus Gardner sided with Wales on some of the more marginal calls. But, anybody suggesting that the officials somehow thieved Ireland is the kind of unhinged conspiracy theorist who might argue that Shergar was kidnapped by Martians. Had they flouted the laws so frequently on a public street, Ireland would have attracted the attention of the local constabulary. Best threw his darts as if he was standing at an oche buffeted by the most violent turbulence. O'Brien was anonymous, a Tullow Tank with the once powerful engine no longer functioning. So much for the notion that the meek surrender to England was a once-off; Rome and Edinburgh offered evidence of a team backsliding, one suddenly enfeebled. Here, Wales smelt the blood of wounded green warriors and pounced on the emerald jugular. Jordan Larmour's injury-time try, one which enabled Ireland avoid a first scoreless humiliation of the Schmidt era, could hardly mask the sustained pattern of rapid regression. At the final whistle, Ireland looked as pulverized as a car put through the junkyard crusher. This was not only the lowest points total (down from the previous baseline of nine) his team had mustered, it was also a rare visit to the tactical basement for Schmidt. He chose to keep the roof open, but then bizarrely declined to adjust Irish tactics accordingly. Wales, in winning their 14th game in a row and a third Grand Slam under Gatland, were ferocious and clinical. Their controlled fury brought the words of their old great Gareth Davies echoing across the years: "For us to lose today, they would have had to dig a hole in the pitch and bury us." Sadly, Ireland didn't even bring a shovel. Schmidt's spiky insistence that the mammoth city centre coliseum remain open to furious elements hinted again at the salty nature of his relationship with Gatland. Luke Fitzgerald, who played under Schmidt for both Leinster and Ireland, shone a light last week on the Welsh coach's capacity to agitate and needle his fellow Kiwi. "I know for a fact that [Gatland] is the only coach that gets under Joe Schmidt's skin." When Gatland and Schmidt are in the same house, there is the uncomfortable feel of raw wounds rubbing together. But it the Irish coach - unable, again, to lay a glove on his fellow Kiwi in Cardiff - who felt blistered at the end of an authentically humiliating Six Nations bow. Schmidt succeeded in keeping the roof open, yet as night fell on a convulsing Welsh capital, he was truly struggling to see the stars.